It’s always a pleasure when we watch a television program from several decades ago and find that it was as good as we remember. For us, that’s true of “The Bob Newhart Show,” which ran on CBS from 1972 to 1978. We rented from Netflix the first episodes in the series, and we were not disappointed. The later series, “Newhart,” was weak by comparison. The tone of the series is set by Newhart’s mannerisms played out in psychologist Bob Hartley’s droll world view. Newhart is one of those rare actors who gets laughs by being a straight man. The show succeeds because the writing, casting, and direction is all in harmony with Newhart’s low-key (below-key, if there is such a thing) personality. Even the more traditionally comic performances – Marcia Wallace as receptionist Carol Kester, Peter Bonerz as dentist Jerry Robinson, and Bill Dailey as neighbor/airline navigator Howard Borden, are relatively subdued so as to create a comfortable context for Newhart’s flat wave. 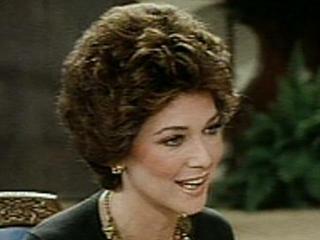 Although the series is built around Bob Newhart’s personality, an important part of its success is Suzanne Pleshette’s performance as Bob Hartley’s seductive, wise-cracking wife, Emily. She was cast in the role in the first place after producers noticed the natural chemistry between her and Newhart on a 1971 broadcast of “The Tonight Show.” The producers weren’t imagining things. Pleshette and Newhart were a high point in television matchmaking. 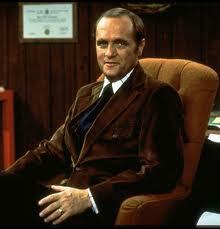 We first became aware of Newhart when he was a stand-up comic; we still have his “Buttondown Mind” LP. His signature routine was the one-sided telephone conversation, a device that he took with him to the TV series. A lot of actors find themselves faking telephone calls, but Newhart perfected it. He was especially smooth in repeating the unheard half of the conversation — doing it so skillfully that it didn’t seem contrived. 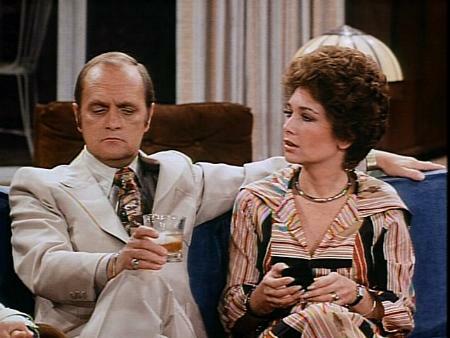 I don’t know how decisions are made about what shows get re-run on television, but I do know that there seem to be endless recyclings of series that weren’t very good to begin with, but no sign of “Taxi,” “Mary Tyler Moore,” or the first Newhart series. Further proof of how good that show was: I doubt I’ve seen a single episode since it ended in 1978, but when you mentioned the characters, I could see and hear each one clearly. Loved this show, and “Mary Tyler Moore.” Your post reminds me of evenings watching these and “The Carol Burnett Show,” “All In The Family,” “The Smothers Brothers,” and on and on. Just sharing laughs with my mother, who never laughed harder than when she watched them.